As Paul and Silas preach in the synagog, many of the listeners search the scriptures to see if what they say is true. AUL AND SILAS were not discouraged when they left Philippi. They rejoiced because they had been chosen by the Lord to carry the glad news of salvation to heathen people. They hurried on to other towns and cities to tell about Jesus. In a large city called Thessalonica they found a synagog of the Jews, for many Jews lived in that place. Here they went each Sabbath-day to teach the people the gospel story. And some of the Jews who listened were convinced by Paul's preaching that Jesus is really the Savior. Also many Greeks, both men and women, received the gospel gladly. But the Jews who refused to believe in Jesus were jealous of the missionaries, because many people listened to their teaching. They decided to get rid of Paul and Silas, so they gathered a company of rough men and made great disturbance in the city. Then they called at the home of one believer, named Jason, and searched his house trying to find the missionaries. But Paul and Silas were not there. Because they could not find these men they dragged Jason before the rulers of the city and cried out, "These men who have turned the world upside down have come to our city, and Jason has received them into his house. They are teaching things contrary to the law of the Romans, saying that another is king, even one called Jesus." The rulers were troubled by these words, but they did not punish Jason severely. However, the believers who lived in that city feared that greater troubles might happen soon if Paul and Silas remained, so they sent them away by night to another place, called Berea. In this second city the missionaries found another Jewish synagog, so they met with the Jews on the Sabbath-days to tell them about the Savior, who had come just as the prophets had foretold he should. 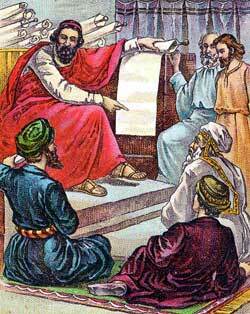 These Jews listened closely to the words of Paul and Silas. They looked into the books of the prophets to see whether the missionaries had spoken truthfully. And many of them believed, for they read the words that the prophets had written long years before, concerning Jesus, the Messiah. Many Greeks also believed, and a large congregation of believers met to hear the gospel story. By and by the wicked Jews in Thessalonica heard that Paul and Silas were preaching in Berea. They sent at once to make trouble there. But the believers there cared for the missionaries, hiding them from the angry men who sought their lives. Then they sent Paul away at once to another city, but Silas and Timothy remained to encourage the Christians in that church. From Berea Paul left the country of Macedonia, and went into Greece. Here he entered a large city called Athens, and waited for the coming of Silas and Timothy.